I'm back to tracking my 3rd great-grandparents today with #19 on the list: James Madison Thomas. I am related to James through my mother's paternal side. 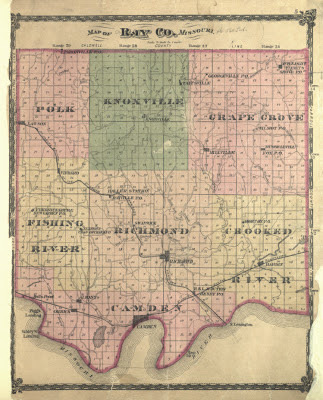 Sometime between 1850 and 1860 the family relocated to Ray County, Missouri. I have every census record available for James. After the family moved to Ray County, James spent the rest of his life in Camden, Missouri. 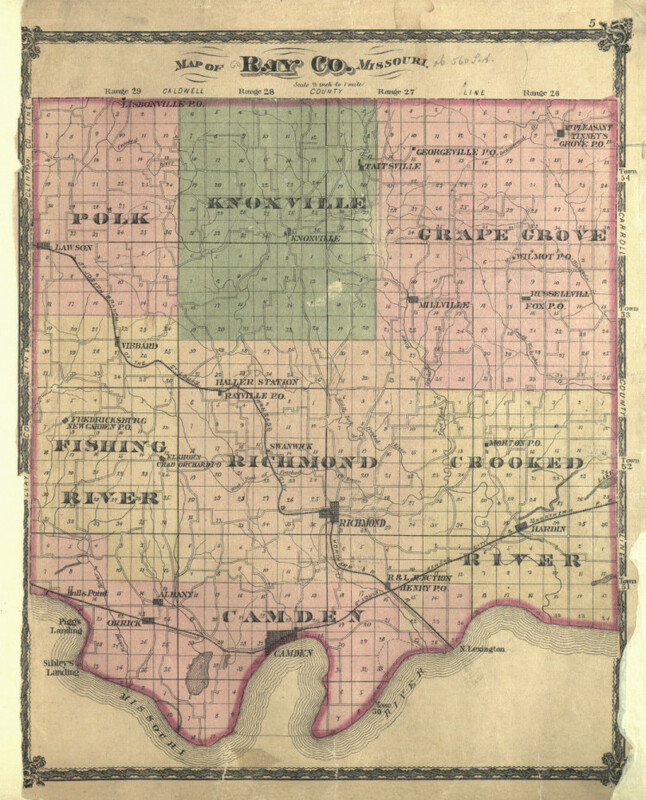 A map of Ray County, Missouri, 1877, from the Missouri Digital Heritage Missouri Plat Book Collection. Camden is in the far south of the county along the banks of the Missouri River. James married Lucinda Megonnigil on October 23, 1870. Marriage record in Ray County, Missouri for James M. Thomas and Lucinda McGonnigil. I have not found the other two children, but it seems that one of them lived to adulthood and one died young. I found that they also lost their son, Rollie, at age 14 due to an accident. James was born in to a farming family, but he became a coal miner, along with at least one brother, John. Coal mining was a large industry in Ray County at just prior to and after the turn of the twentieth century. A description of Camden, Missouri from the History of Ray County, Missouri, 1881. Based on this description of Camden, Missouri, it is possible that James Thomas was a coal miner right in his back yard, though there were mines in other parts of Ray County. James Madison Thomas died on September 4, 1917, in Camden, Missouri. He is buried in Cravens Cemetery, Camden, Missouri. 1. Get a photo of his headstone (I have had a request on Findagrave.com for this since 2011, I'll probably just head there myself on my next visit to Missouri). 2. Find out more about the origins of the Thomas family in Kentucky. 3. Try to determine James' and Lucinda's other two children.